If the Losers’ Club can take on an all-powerful demonic clown like Pennywise and Charley Brewster can face off against a vampire next-door, four nebbish but scrappy eighties kids ought to be able to handle their neighborhood serial killer. However, there is one slight complicating factor. It is not absolutely certain Wayne Mackey is the killer stalking Cape May, but there is no doubt he is a local copper. 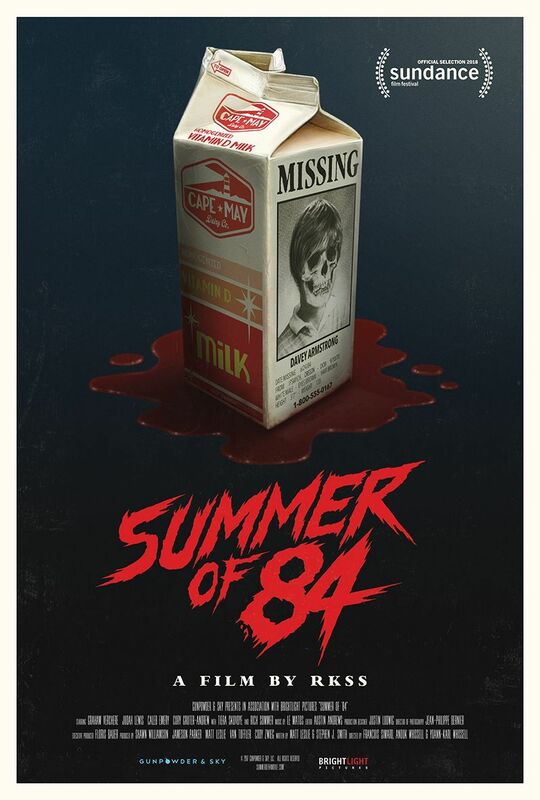 Of course, Davey Armstrong is not about to be dissuaded by awkward facts like that, but his friends will need constant convincing in François Simard, Anouk Whissell & Yoann-Karl Whissell’s Summer of ‘84, which screened during this year’s Fantasia Festival. It is 1984. The Reagan-Bush ticket is cruising to re-election, college grads actually expected to land jobs, and fifteen-year-olds like Armstrong and his buddies were not nearly as jaded by the media and pop culture as they think they are. Armstrong, Tommy “Eats” Eaton, Dale “Woody” Woodworth, and Curtis Farraday are all preoccupied with girls, but Armstrong also has an abiding interest in lurid conspiracy theories. While most Cape May residents are alarmed by news of the serial killer, he is thrilled by it. As luck would have it, Armstrong, the paperboy, happens to spy some rather suspicious but circumstantial details around Officer Mackey house while collecting for the month. Aided by his own imagination and his friends’ boredom, he manages to convince the gang to launch an ambitious surveillance operation. The stakes will raise dramatically when the boys inevitably blow their cover. However, Armstrong’s attention will also be somewhat divided when Nikki Kazsuba, the somewhat older literal and proverbial girl-next-door starts paying (essentially platonic) nocturnal visits. Obviously, Summer of ’84 hopes to ride the 1980s horror nostalgia wave, launched by Stranger Things and It. Be that as it may, Summer happens to be smartly written and skillfully executed. It hits all the right notes, but it is also willing to go to some surprisingly dark places. In terms of tone and aesthetic, Summer is a dramatic departure from the directorial trio’s prior film, Turbo Kid, but it is clear from both works, the tandem knows and appreciates their 1980s genre films. The four young co-conspirators all look age and era appropriate, but Judah Lewis really stands out as the spectacularly foul-mouthed Eaton. Yet, Tiera Skovbye scores some of the biggest laughs as the sly but sensitive Kazsuba. However, it is Rich Sommer who really makes the film work by maintaining audience uncertainty with a performance of perfectly calibrated ambiguity. Summer of ’84 is a great deal of fun, because it convincingly evokes the eighties era and suburban milieu. It also proves Simard, Whissell, and Whissell have considerably more range than we might have thought.